"Computer Not Authorised for User" message appears after installing and opening Voyant – Have a question? Issue - I am attempting to install Voyant on a new computer. After downloading and installing the software, the following message appears after the software launches. Cause - Voyant licenses normally allow the licensee to run the software on up to two authorised computers. Voyant is not a kiosk software that can be used on any and every computer, which is important, considering that client information can be encrypted and stored locally for offline access. When Voyant is installed on a computer (or a server), that machine's MAC address will be registered, tracking it as one of the user's two authorised devices. 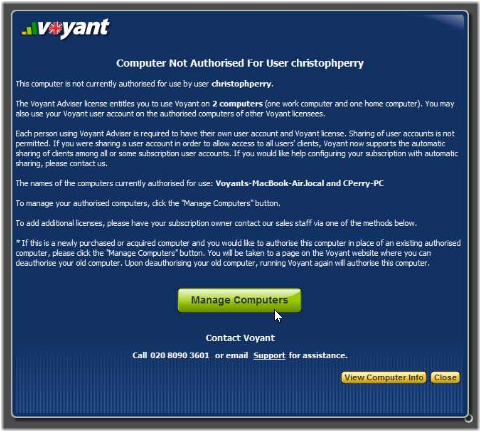 If Voyant were then installed on a second computer, the second authorisation slot would be taken automatically. 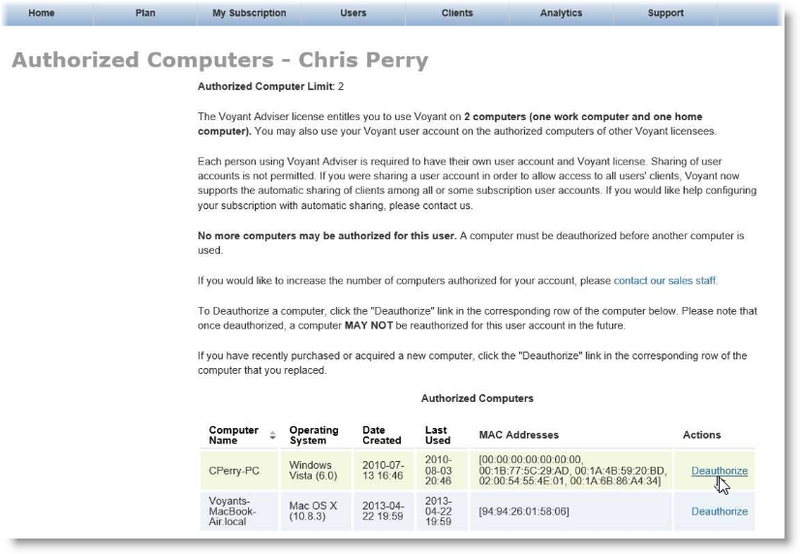 If the user were to then attempt to install Voyant on a third computer, exceeding the two computer limit, a message will display stating that the authorisation limit has already been reached. Solution - This message provides a Manage Computers link to a web page where these authorised computers can be reviewed and potentially deauthorised. Note: You may deauthorise a computer and reauthorise another, thereby freeing an authorisation slot for use by another computer. But once a computer has been deauthorised, you would need assistance from Voyant Support to reauthorise a computer. We enforce this rule so as to prevent license abuse. Authorised (Authorized) Computers and Authorisation Limits - Is there a limit on the number of computers on which I can install and run Voyant?